Reviews of the work of Elizabeth Gilbert almost invariably include a sentence or two noting the enormous success of her memoir, Eat, Pray, Love, and frequently make reference--sometimes snide, sometimes admiring--to the legions of besotted female readers who found inspiration in Gilbert's tale of physical and spiritual longing and discovery in the wake of divorce. So at times I wonder what's wrong with me, as I count myself as one of the few males I know who is an an utter devotee of Gilbert's work. I count her, along with Jon Krakauer, as one of the two greatest modern masters of the nonfiction form. I fell in love with her memoir the first time I read it, and have subsequently assigned it in multiple classes I have taught. At this point I have read it close to a dozen times, and still find it as enjoyable as the first time through, as each new read gives me the opportunity to admire and emulate her quick wit, her playful prose, her nuanced depiction of complex spiritual conflicts, and her skillful handling of narrative structure. I admire all of these qualities in equal proportion in her previous nonfiction book, The Last American Man, a portrait of mountain man Eustace Conway. Almost every semester I find myself assigning one or the other of these two nonfiction works to my students, in part for the great joy I take in re-reading them myself, but more importantly because her work provides such excellent models for my writing students in so many areas. 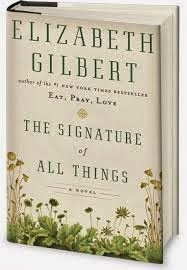 Hence it was with some trepidation that I finally undertook to read The Signature of All Things, Gilbert's epic new novel, as soon as the fall semester was over. I had purchased the book shortly after it was published a few months back, but had been reading about it for much longer than that, thanks to Gilbert's countdown to publication on her Facebook page. I had read and heard so much about the book that I feared from it the disappointment one sometimes experiences from a long-anticipated event. I finished the book this evening, the last day of 2013, and can happily say that I have found in it the same lovely writing that I have admired so much in her nonfiction writing. The book is a big and generous read, a novel of 19th-century America, of scientific curiosity, of sexual longing, and of world exploration. I won't spend much time here reviewing it, as the book has been reviewed in so many places already. You can read a glowing review of it on NPR, for example (and note, by the way, the subtly gendered reference to fans "tearfully clutching" copies of her previous books), or a more mixed appraisal from the New York Times. But here's what I really want to say about Gilbert, and what makes me such an admirer of her work. On every page of this novel, as on every page of her nonfiction writing, one can see the imprint of a human being who finds the world an utterly fascinating place, and who seeks to learn from it afresh at every turn. I can imagine almost any human being on the planet meeting Elizabeth Gilbert at a party, and telling her some seemingly insignificant fact about him or her self, and Gilbert's eyes lighting up with genuine interest, and exclaiming: "Really? Tell me more about that!" And that response would be a completely genuine one. As a constant reader of nonfiction, both literary and otherwise, this quality seems to me missing from so much of the genre. Too many writers expect that, now that I have sat down with their book, I should sit up straight and pay attention: "I wrote a book; sit quietly and learn." Gilbert never seems to take this for granted. One hears, behind almost every page of her writing, an unspoken sentiment of sheer enthusiasm for her subject matter: "You think that was interesting--wait until you hear what's next!" In this respect, good nonfiction writing is a lot like teaching. As I have argued in a recent essay in the Chronicle of Higher Education, about the tragic death of teacher Colleen Ritzer, teachers have a responsibility to model intellectual curiosity for their students. Before we can expect students to sit up straight and learn, we have to entice them to take a seat and wonder about what we have to teach. The teacher's passion for learning, and for her subject matter--just like the passion of the writer--strikes me as an essential tool in helping to accomplish that objective. Gilbert's writing makes me wonder, and that wonder draws me into her travels, her characters, and her research. At the conclusion of Gilbert's new novel, her heroine responds to a question about whether or not she believes in an afterlife with an encomium to the world we have before us: "I have never felt the need to invent a world beyond this world, for this world has always seemed large and beautiful enough for me," she says. "All I ever wanted was to know this world. I can say now, as I reach my end, that I know quite a bit more of it than I knew when I arrived." At the end of The Signature of All Things, just as at the conclusion to her nonfiction books, I find myself not only knowing a little bit more about this world, but also energized to get out and conduct some explorations of my own. As this year rolls into a new one, I hope to take a page from Gilbert and find new ways to inspire both readers and students to do the same.